There are so many posts and articles in The Internet and maybe anyone already know that Google collect almost all our online data, including our location, contacts, search preferences, etc. Few days ago, when I used my Android phone to book flight and got ticket by email, Google parsed my email and know when, where and how I will go. 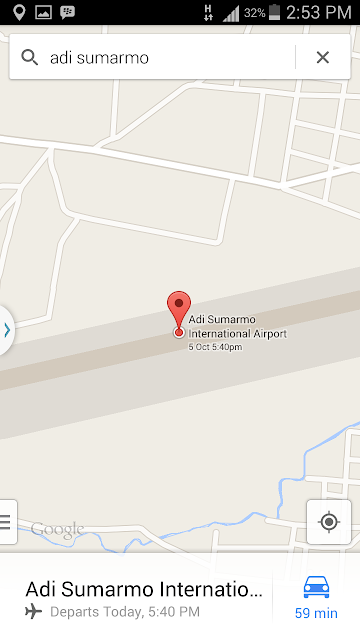 I did not familiar with Solo City area, so I used my gadget to find Adisumarmo Airport, Boyolali Regency (SOC). Google give me exact location and nearest route from my place, and also told me that my flight will depart at 17.40 GMT! That technology make my life easier, but it also scary me. There are so many good persons at Google, but I also afraid that there are some bad guy over there. Just hope that everything okay with our online data and privacy. I write this post in waiting room of SOC Airport, of course I pray for a safe and nice flight to my destination. Cure for Ebola from Papua?